Printed on 8mil Clear Static Cling. Option for white ink for extra fee. Clear Window Clings cling on the front side of the print. If your Clear Window Cling is intended to be viewed from the outside of a window, then the artwork must be reversed prior to submission. 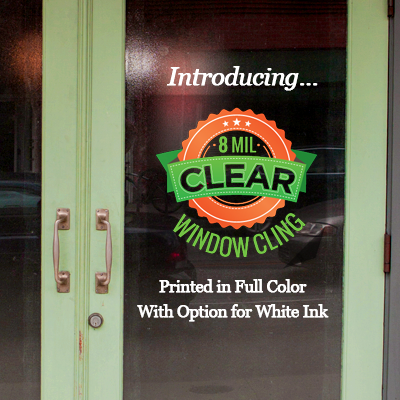 Clear Static Cling: If you’re looking to dress up your window, look no further than our Clear Static Clings. Whether on a store window, car window, mirror, or home window, these clings are sure to catch the eye of passersby. Our static clings never leave any marks or adhesive residue behind—they rely on static electricity to adhere to surfaces, so you can rely on them to deliver your message with ease. Clings are printed in full color on a quality 8mil Clear Static Cling with the option to add crisp, white ink. Available in a variety of sizes and in quantities of 1, 3, 5, 10, and 25. Select if you would like your project to print with white ink. White Ink is specified by submitting a white ink mask. If you are submitting your own files for printing and choose to print with white ink, you will need to supply a white ink mask file indicating the area to receive white ink with a CMYK BLACK color combination of: 0%c - 0%m - 0%y - 100%k. Anything filled with this color combination will print in white.